The Seventeenth Judicial District Commission on Judicial Performance unanimously recommends that Judge Byron Lynn Howell BE RETAINED. Judge Howell, an Adams County Court Judge in the Seventeenth Judicial District, was appointed to the County Court bench in 2008 and presides over criminal and traffic cases. Prior to his appointment, Judge Howell served as a Deputy City and County Attorney in Broomfield since 2001. He previously served as a Washington County Attorney, an Assistant Morgan County Attorney and the supervisor of the Pre-Trial Services Unit in San Diego Superior Court. 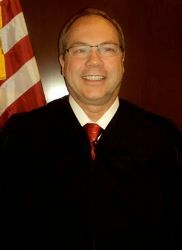 Judge Howell received his bachelor’s degree from the University of Northern Colorado in 1978, his J.D. from the University of Wyoming in 1994 and his Master’s in Public Administration from San Diego State University in 2003. In arriving at their recommendation, Commission members interviewed Judge Howell after reviewing survey results provided by lawyers, parties, and other individuals who appeared in front of Judge Howell or otherwise observed him in court. The Commission members also reviewed Judge Howell’s self-evaluation, observed him in court, and reviewed a number of decisions rendered by the judge. During this election cycle, Judge Howell’s survey results from attorneys and non-attorneys revealed his ratings were only slightly below the statewide average among all county court judges standing for retention. Of attorneys responding to the survey, 58% recommended to retain, 25% not to retain, and 17% made no recommendation regarding retention. Of non-attorneys responding to the survey, 87% recommended to retain, 6% not to retain, and 6% made no recommendation regarding retention. (These percentages may not total 100% due to rounding). The Commission believes that Judge Howell keeps up to date on the law and applies it fairly and uniformly. Survey results indicated that Judge Howell needs improvement in docket management and being more decisive in the decision making process. When these issues were brought to Judge Howell’s attention, he agreed that in the past he has had concerns with both issues. However, Judge Howell also indicated that he has begun putting systems in place to more efficiently run his courtroom. With regard to decision making, Judge Howell acknowledged that others have raised concerns regarding the way he addresses legal arguments and decision making, and will strive to provide more efficient and decisive decision making. Judge Howell was able to openly address all issues raised, and indicated that he strives to continue to improve and serve as a County Court Judge. Based on its review of returned surveys, review of several of Judge Howell’s decisions, courtroom observations, and interview of Judge Howell, the Commission unanimously recommends that Judge Byron Lynn Howell BE RETAINED.